For what is perhaps the most familiar and everyday of the physical properties, time has remained a highly perplexing mystery to physicists. Our minds evolved to have a sense of the passage of time. Perhaps the only other physical property so intuitively familiar to us is that of matter itself. Having a mental construct of the world where there is a passage of time, and where things have shape and solidity, had it’s obvious survival advantages to a clever young primate species first becoming self aware on the African savannah. There was no selective pressure for us to have any intuitive sense about quantum mechanics or general relativity since these phenomena could not be sensed by our evolving minds. This makes it seem to us, as though we are born with an intuitive knowledge of what time and matter really are. We have a common sense about them, but our innate understanding of such things doesn’t necessarily correlate with a true understanding. Our sense of physical law evolved to be useful, but there was no reason it needed to evolve to be accurate. In fact, we know that modern science tells us that solid matter is anything but solid. It is composed of tiny atoms that are themselves made of nearly entirely empty space. Electromagnetic forces of repulsion between electrons in the atoms of a wall, and those of your body, give to us the illusion of solidity, and make any attempt to walk through the wall very painful. The same is likely to be true about time. Despite how many times we look at our watches each day, we really don’t get it. At the subatomic scale time doesn’t seem to have much meaning. If you observe two elementary particles interacting, you wouldn’t be able to tell if you were being shown the interaction in forward or reverse. The laws of physics do not differentiate a forward or backward flow of time at this tiny scale. It is only when we start to observe very large collections of particles on the macroscopic scale that there appears to be an arrow of time – a particular direction to flow. You could tell the direction of a movie if it showed an egg breaking on the floor. We know broken eggs don’t just fly together and become unbroken. This is due to the effect of entropy, which is simply a measure of the statistical likelihood of how a system will change. While there can be local decreased in entropy, the overall net effect is one of increasing entropy, and this leads to our conception of an arrow to the direction of time. One way of looking at it is by considering a large collection of gas atoms. Lets say helium atoms confined to a gas cylinder. There are very few ways that the helium atoms can be arranged in an orderly way. If they are all packed together down at the bottom of the cylinder, or they are all forming a sphere in the middle, or arranged into the letters “He” (for helium), towards the top of the cylinder, and so on. There is nothing saying they can’t do that, but it is statistically very unlikely. It is much more likely that the helium atoms are arranged basically randomly throughout the cylinder. That is because there are so many more ways the atoms can be arranged in a disorderly random state, than in one of the few orderly states. From the macroscopic view, the many states where the gas in the cylinder appears disorderly all look the same. They actually aren’t the same, all the atoms could have been in the exact opposite site of the cylinder from where they actually were, but to us it would still look the same. It is this movement towards a more disorderly state, the increase in entropy, that seems to suggest an arrow of time at larger scales. Well, some physicists now feel that the passage of time is an illusion altogether, and that instead the universe exists in something called block time. In a block time kind of universe the entire universe, from beginning to end, is always in existence. Everything in the past is just as real as everything happening right now in the present. Even more incredible, everything in the future is just as real as this moment you are experiencing right now. There is no difference between past, present, and future, if block time is correct. This view is also called untensed and, as such there is no privileged point of view in time. This is obviously counter to our common sense view where the present has the only privileged status and is constantly flowing. Now is real, but wait, that point in time is now gone and we can never get it back. Now is dead, long live the now! This kind of view, the way our natural intuition feels most comfortable is called Presentism. But as I’ve said, common sense isn’t necessary leading us to truth. The Caltech theoretical physicist Sean Carroll, who has written several popular physics books including, “From Eternity to Here” and “The Particle at the End of the Universe”, says that he finds the block time concept, “perfectly acceptable”. It is far from settled whether this is the best description of the universe and is still being debated in theoretical physics circles, but if true would seem to have some amazing philosophical implications. For one, this would seem to imply a kind of immortality. Our life is just a tiny line in the cosmic loaf of block time (I like to picture it like a loaf of bread with a thin slice as being everything we think of as the present moment). 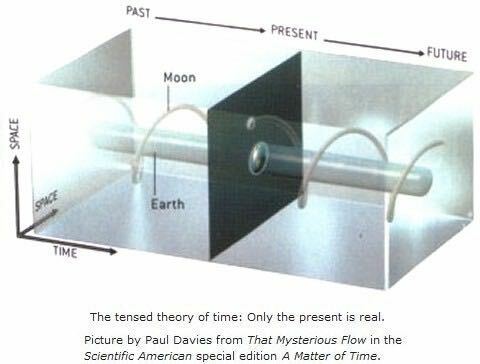 Of course, the whole idea of block time is that the entire loaf of bread (past, present, and future universe) is all right there, so our tiny time line always exists. Maybe that would explain why you and I feel alive at this very moment even though our lives are likely to be only a century or so out of the hundreds of trillions of years that the universe is likely to exist. It would seem very unlikely that the universe should be in that very special time right now when we are alive. I mean shouldn’t it be much more likely that the universe should be somewhere in the next trillion years than in here at 13.7 billion years since the big bang? The usual answer would probably be to simply invoke the fact that if the universe wasn’t at this point then we just simply wouldn’t be here to wonder about it. That might be just fine, but it is still statistically an astronomically unlikely coincidence. Ok well, lets just run with the block time thing for a second here. Every moment in time is just as real as every other. What ever is going to happen in 100 trillion years from now is just as real as what is happening now as I type this sentence. Oh, and by the way, you and I are long dead and forgotten in that slice of the bread 100 trillion years down the road. But we will continue to live in our limited slices of the loaf forever. I’m always experiencing this very moment, and the moment that I was born, and the moment I died, and every other moment of my life. In that sense we are immortal in the block time universe. If so, then that makes heaven and hell completely real too, in that you and I are in them both, always and forever. I don’t mean that heaven and hell exist in another dimension or have a supernatural existence. All I mean to say is that we all have moments in our lives where we feel great joy and happiness, even if it is very momentary. And likewise there are moments where we are deeply hurting and in pain -again they may be very short periods, but yeah, they can be pretty bad. That “us” that is experiencing the moment of joy, happiness, or pleasure is basically always in a kind of heaven. Unfortunately, that “us” in those moments of pain, hurt, depression, worry, fear, or despair is also always in a kind of hell. The majority of our lives are somewhere between the peaks and troughs, in the just “business as usual” sort of mundane life events. Forever in front of the TV, climbing the stairs, brushing our teeth, looking for something to eat in the fridge, and of course sleeping in non-dream sleep. Block time also challenges our ideas about free will. In a block time universe, everything is already destined to happen in a certain way. The future is just as unchangeable as is the past. We simply have the illusion of free will, but there is zero chance that we are going to do anything other than what is already engrained into the block time universe. The question of free will is one that philosophers have been discussing for centuries, long before the concept of block time entered the theoretical physics arena. Philosophers might use the word volition instead of free will. Can we have volition and still have a deterministic universe? We may have the illusion of making choice, but the outcome has always been in existence in block time. It would seem a bit like watching an old familiar movie. The characters seem convincing in their parts, their emotion, reactions to events, and so on, but you already know everything that is going to happen and nothing will change the course of events in the film. It’s unclear if the block time concept of the universe can be proven, or if it is even falsifiable, but certainly the philosophical implications of such an existence seem fascinating. Perhaps our lives really are both eternal and finite. In any case, making the most of this existence would seem to be important. Maximizing the ups and minimizing the downs, and doing so for others as well would seem important if we, and they, are always alive in the moment. Perhaps our fates are already decided, but who’s to say that our intentions are not what sealed those fates to begin with. I’m suddenly reminded by a scene in “The Hitchhikers Guide to the Galaxy”, where a bowl of petunias is suddenly called in to existence miles above the legendary planet of Magrathia. And as it is falling towards the ground, about to be smashed to bits, the thought, “Oh no not again” runs through its mind. The narrator says, “Many people believe that if we knew exactly why the bowl of petunias thought that, we would know a lot more about the universe than we do today”. Previous article	← You once had six kidneys, and no you’re not an alien!